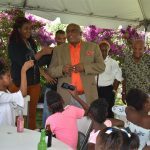 BASSETERRE, ST. KITTS, December 5, 2018 (PLP PR Media Inc.) — A relationship cultivated between renowned businessman, and former Government Minister, Mr Richard Caines and Grade Five students at the Dr William Connor Primary School was cemented on Wednesday December 5 with former throwing an early Christmas party for the latter. The party which was held at Mr Caines’ residence in Greenlands was so special that in attendance were the Head of State, Governor General His Excellency Sir Tapley Seaton, GCMG, CVO, QC, JP, Head of Government, Prime Minister Dr the Hon Timothy Harris, and the Federation’s First Prime Minister and only Living National Hero the Right Excellent Dr Sir Kennedy Simmonds. 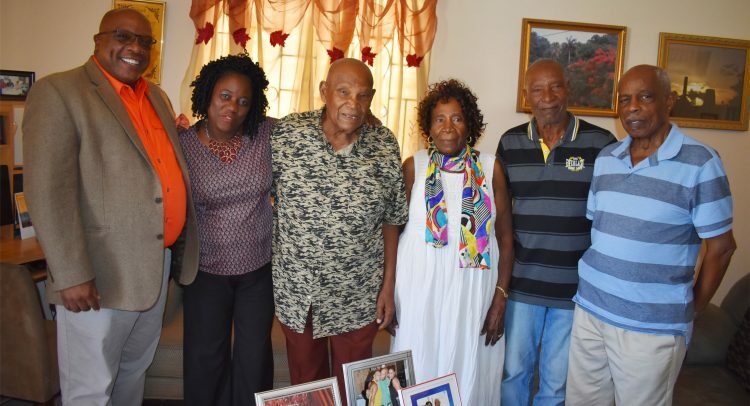 Also present were Principal of the Dr William Connor Primary School Mrs Jean Boddie, retired educator and linguist Dr Ismay Taylor, businessman Mr Oliver Spencer, and teachers from the school – Ms Aleica Nembhard, Teacher Grade 5A1; Mr Benjamin Thomas, Teacher Grade 5A2; and Ms Ghislaine David, Teacher Assistant. Prime Minister Harris, who is also the Minister of National Security, is a firm believer that peace and safety of the country is everybody’s business and as a result he took time to advise the keenly listening and well-behaved Fifth Graders that they should also contribute to the peace and safety of the Federation while they are at home during the December holidays. The Honourable Prime Minister advised the students to turn up in large numbers for the children’s carnival this year and hoped that the school was organising a troupe. While wishing them the very best for Christmas and carnival he advised them to come back in January prepared to learn their lessons and to make themselves first, then their parents, their families and their community proud of them. 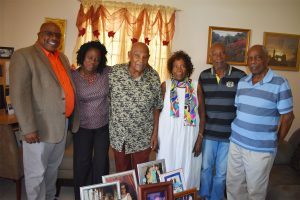 Grade 5A1 teacher Ms Aleica Nembhard, noted that the students first met Mr Richard Caines when they visited the Zack Nisbett Museum in Buckley’s Estate while doing research on the topic ‘Independence and Emancipation’. Mr Caines’ birthday was on Thursday October 4, and he spent a portion of the day with students at the school where he held the birthday party. The children who were thrilled at being around him gave him cheers and it was then that he promised them that he would give them a Christmas party.